On this weekend every year, we witness what I consider to be one of the more amazing displays of zeal, stamina, perseverance and drive that the typical American can show. Beginning in the wee hours of the morning on the day after Thanksgiving, millions of Americans flock to the stores and shopping malls determined to shop 'till they drop. Retailers call it "Black Friday" - the beginning of the holiday season and one of the most important times of the fiscal year, which can often serve as a barometer for economic health. I saw news reports in the last couple of days of individuals who camped out starting at 3 a.m. in order to be the first in line to cash-in on amazing savings. There were similar scenes all over the country of hundreds of shoppers urging storeowners to open their doors just a few minutes early so that they could begin buying their goods. Imagine, in just two days, Americans spent nearly $7.2 billion dollars alone in retail purchases. Astounding. Now, there's nothing wrong with shopping and there's nothing wrong with wanting to save money. Yet, I think that we'd all agree that there's something seriously wrong in a Christian country like our own when the amount of energy expounded on shopping and so-called preparations for Christmas in the temporal and secular sense is highly disproportionate to the amount of energy and time spent preparing for Christmas, spiritually. After all, it is the birth of our Lord that we are celebrating on the 25th of December. Or is it? So many religious references to Christmas have been removed from the public discourse. In many public school systems, for example, the 10 days of vacation surrounding December 25th is most often referred to as a Winter Break. In some municipalities, courts have ruled that the crèche scene is not inclusive and therefore should be removed from public buildings. What was once really a holy day season, is now called the holiday season - a feast for consumerism, materialism and obsession with amassing goods. Every year, college friends of mine host a Christmas party at their home up in Arlington. I had attended the party regularly until I entered seminary and then was unable to attend until last year, my first Christmas as a priest. In fact, I almost did not attend the party because I don't like celebrating Christmas during Advent. In any case, as I was talking to various persons at the party last year, I often wondered how many of the persons there really knew why there was reason to have a party. Some of them openly admitted that they may go to church, depending on how tired they were. It seemed like the religious celebration of Christmas was no more than an after thought. Our readings today point to the awesome reality of the return of Christ at the end of time. The prophet Jeremiah states that "The days are coming, says the Lord, when God will fulfill the promise He made to send us a savior, His only Son and his name shall be called "justice." "Justice!" What a curious name. Justice is a virtue which means "giving another person what they are owed - what is due to them." That is what Advent is all about - preparing our heats and our minds in such a way that we can truly give God what we owe Him - our praise, adoration and thanksgiving for all the He has done for us and all that we hope He will do for us in the coming year. It means expressing our awe at the mystery of the Word become flesh in the person of Jesus Christ - true God and true man, in the fullness of time, the fulfillment of all the prophecies. In our Gospel today, we are given an apocalyptic account of the End Times. Our Lord tells us that in fact, "People will die of fright in anticipation of what is coming upon the world, for the powers of heaven will be shaken." I don't know about you, but these words of our Lord don't exactly inspire the "warm fuzzies" normally associated with this time of year. Advent is not usually identified with fear and trembling. What the readings point us to is the reality that as much as the secular culture has attempted to get us to set our sights on the concerns of what will be the best gift or what will make the perfect Christmas, it is in fact the case that our true homeland is in heaven and that we should set our sights on preparing ourselves by that standard in order to experience a more perfect celebration of Christmas..
To meet this end, our Gospel provides us with three instructions on how to prepare spiritually for Christmas during this Advent season. 1. First, our Lord tells us that in spite of the fear that the world will have over the signs of the end times, we, as believers need not be afraid. In fact, we should stand erect and raise our heads in anticipation of our redemption. In other words, we should be looking forward to the day when our Lord returns in glory. 2. Second, our Lord tells us to beware that our hearts do not become drowsy from carousing and drunkenness and the anxieties of daily life. In other words, we ask ourselves, "What will occupy our thoughts in the days and weeks to come as we prepare for Christmas?" "Will it be all those details of trying to "keep up with the Jones'" so as to have a perfect Christmas? Or, will it be our desire to take time daily to listen to the Lord in prayer and the reading of the Scriptures? Will we allow ourselves to get caught up with what our society has deemed makes Christmas special or will we get caught up sitting at the feet of our Lord in front of the tabernacle in silent prayer?" 3. Lastly, our Lord tells us to be vigilant at all times and pray that we have the strength to escape the tribulations that are imminent. How vigilant and alert will we be throughout Advent? Will we commit to starting a novena to the Immaculate Conception, which would begin this weekend? Can we get to a daily Mass once a week outside of Sunday this Advent? Can we persevere in our commitments and resolutions all the way to Christmas? What will be our resolutions for 2004? My brothers and sisters in Christ, let us ensure that we actually celebrate Advent this year. 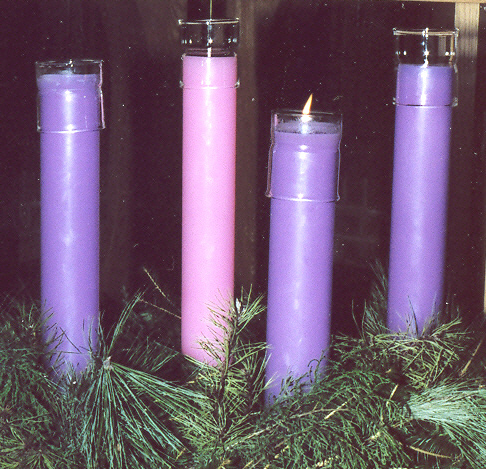 The purple vestments and candles should remind us that it is a season of penance and mortification - a season of cutting back and detaching from all the excess that our consumeristic culture preaches will make us truly happy in order to make room for the things that really matter - preparing our hears with a good confession; praying the rosary and meditating upon the Joyful Mysteries and taking time to read the infancy narratives in Matthew and Luke so that on Christmas Eve, we will be truly able to make the words of the Responsorial Psalm antiphon our own and say, "To you, O Lord, I lift up my soul."